On Saturday, December 15, demonstrators took to the streets of Los Angeles to demand, among other things, smaller class sizes, more support staff, and a pay raise for teachers in the Los Angeles Unified School District. 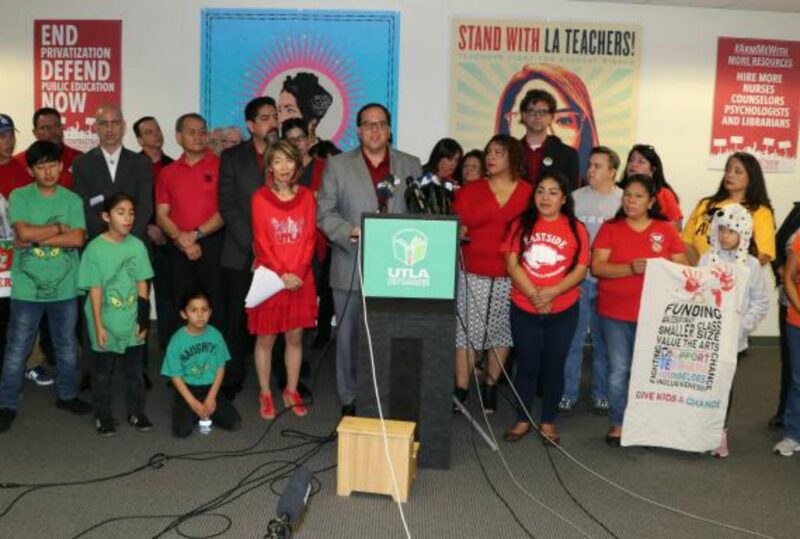 The March for Public Education was organized by United Teachers Los Angeles (UTLA) on behalf of educators from around the city. Thousands of people including teachers, students, and union representatives participated in the march from city hall to the Broad; that endpoint was selected because the museum’s namesake, billionaire Eli Broad, has been a fervent supporter of the charter school movement. Laura Press, a 28-year veteran of L.A. public schools who currently teaches English at Hamilton High School in Palms, has been a vocal advocate for the strike. She traces many of the issues now plaguing the district to the tenure of John Deasy, who was LAUSD superintendent from 2011 to 2014. In Press’s opinion, Deasy put an undue burden on educators. “[He] decided that the problem—all of the problems, both related to education and the managing of a very large urban school district, and the general problems facing the social and economic vibrancy of the United States—could fall at the feet of the classroom teacher,” Press says. According to Press, it was during that period that standardized testing became a primary means of measuring teachers’ efficacy in the classroom; teachers whose students didn’t perform well on the tests were “vilified,” she says. Meanwhile, the rise of charter schools—which have frequently been accused of unfair admissions practices that affect students with disabilities and those for whom English is a second language—has contributed to greater socioeconomic displacement among her students. She takes issue with the presumption that the strike is all about money. “We are literally fighting for the dignity of our students,” she says. She supports the union’s decision to call for a strike for two major reasons: she wants to see a reduction in class size (Press says that in one of her classes she’s forced to stand while her students sit due to lack of space) and increased oversight of charter schools’ budgets. She fears that without oversight, charters will overtake the public school system, as they have in places like New Orleans. “We are sort of the last bulwark against the end of public education as we know it,” she adds. The educator, who teaches advanced placement courses, says she loves the school she’s in and describes a professional culture with a lot of in-house support. She was an LAUSD student in the 2000s, and recalls a lack of resources like toilet paper in the bathrooms and proper desks for students even then. The teacher says that even though she’s a newer member to the union, she’s skeptical that the two parties can negotiate in a way that is going to help anyone. Like her veteran colleagues, she’s prepared to strike for her fellow teachers but also on behalf of students, who she says are being denied things like tissues and basic medical supplies. She’s adamant that she didn’t get into education for the pay, so a potential salary increase is secondary to other concerns. “I went into it in the hopes—and this is very idealistic of me—in actually having an impact on people,” she says.